There was no shortage of great music at this year’s Coachella Valley Music and Arts Festival — just ask Janelle Monae, who stole the show as one of the most dynamic performers of the two weekends. But in between beloved indie bands like The Postal Service, age-less veterans like New Order, the obligatory reunion performance (Wu-Tang Clan), and, of course, the headliners (Blur, Phoenix, and Red Hot Chili Peppers), there were three can’t-miss Latino acts: 3Ball MTY, Café Tacvba, and Rodriguez. Vastly different in their repertoire, all three were consistent in drawing large and eclectic crowds, which hopefully means that next year, we’ll see more diversity in the line-up and a greater number of Spanish-language acts. 3Ball MTY kicked things off early Saturday with their signature tribal guarachero sounds, mixing in their own hits like “Intentalo,” the song credited with pushing them into the international scene in 2012 and earning them a Latin Grammy for Best New Artist, and playful remixes of mainstream hip-hop cuts like “N*ggas in Paris,” by Jay-Z and Kanye West. Though some (myself included) initially doubted whether they were deserving of their place in the prestigious music fest’s lineup in the first place, their set reaffirmed that this is a place to see not only established greats but also promising up-and-comers. Horacio Mayorga, 30, an engineer who came from Mexico City to see them and says he has been listening to their music for three years, is a bit older than the boys of 3Ball themselves (DJ Erick Rincon, DJ Sheeqo Beat, and DJ Otto, all in their early twenties), which only confirms that their appeal is beyond the obvious. “I really like that they mix the sounds of ancient, indigenous pre-Hispanic peoples, primarily from Mexico but also from all of Latin America, with electronic rhythms,” said Mayorga. “They’re very innovative.” According to Mayorga, 3Ball’s movement is still going strong back home in Mexico, and after yesterday’s set, it’s clear that what began as a pointy boot fad is here to stay. Also on Saturday, Café Tacvba cemented their place as Mexico’s most progressive and beloved rock band (easy, Maná fans, we’re talking alternative rock, not pop-rock). The veterans, who have been in the music game for nearly 25 years, played on the main stage, a fitting place. If you’ve ever been to a Tacvba show, then you know that the expressions of fandom are a key component of the overall experience. At Coachella, there were giant Mexican flags, ponchos, mariachi hats, colorful piñatas, and men in bright luchador masks. Part of the magic is also lead singer Rubén Albarrán’s conversations with the crowd. “I’m gonna try to e-speak more Inglich,” he said in his endearing accent, mixing it up with Mexican slang and random salutations in other languages like Portuguese and Japanese. “Quiero que la pasen bien chingón, Coachella,” he said, mid-show. And that’s exactly what the crowd did. 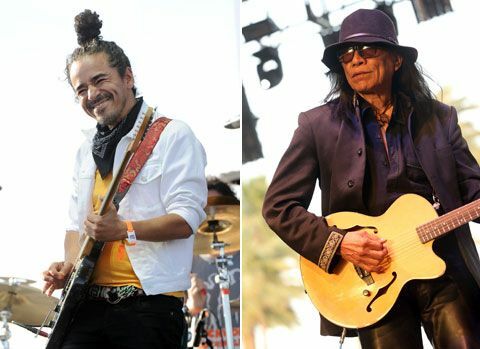 On Sunday, 70-year-old folk rocker Rodriguez performed to a tent packed with a mostly young crowd, fans who most likely became exposed to his music after the 2012 Oscar-winning doc, Searching For Sugar Man. The Detroit-based, Mexican American legend, whose birth name is Sixto Rodriguez, appeared in an outfit befitting of his near-mythical place in music history: a black fedora, black shirt, black leather pants, black boots and a black trench coat. Backed by a drummer, an electric guitarist, and a bassist, Rodriguez delivered songs from his socially conscious first album, Cold Fact, originally released in 1970, the same one which went relatively unnoticed in the United States but went multi-platinum in South Africa, where he became a symbol of the anti-apartheid movement. From “I Wonder,” a track in which he asks about the fate of those neglected by society and their broken dreams, to “Sugar Man,” after which the documentary is named, to a cover of Little Willie John‘s 1956 classic “Fever,” Rodriguez reminded everyone why his message, like him, is timeless. “Coachella, it’s been an honor, a pleasure, and a privilege,” he said before parting. In truth, the privilege was all ours. This story was originally published on Latina.com.